Oh McDelivery – or for those not down with the lingo, McDonald’s Delivery - it’s the stuff of dreams, right? Imagine: you’re at home, get a craving for a Quarter Pounder with Cheese meal but you have NO intention of leaving the house – what do you do? Maybe you’re busy wrapping Christmas presents. Or waiting for the girls to come over before a night out - OR maybe you just had one too many drinks at the work Christmas party last night (no judgement). Well in step McDelivery to deliver those beautiful fries directly to your door. It's super simple to use. If you live within 1.5 miles of a participating restaurants (and there’s now over 700 of them), all you need to do is order via the UberEats app or website. Once you’ve selected your delivery location and chosen your nearest restaurant, you can then place your food order, pay and sit-back as your food is prepared and hand-delivered to your door. Most orders are with you within 20 minutes which is more than enough time to get Elf up on the TV, ready for when your food arrives! To find out if your local Maccie's delivers, just head to the McDonald's website! While we were out in Thailand, I ate SO much sea-food. Huge juicy prawns, fresh blue crabs and giant red snappers - almost on a daily basis. Since coming home, I’ve been on a quest to get more fish into my diet and I've found just the spot in West London where I can get my fix! 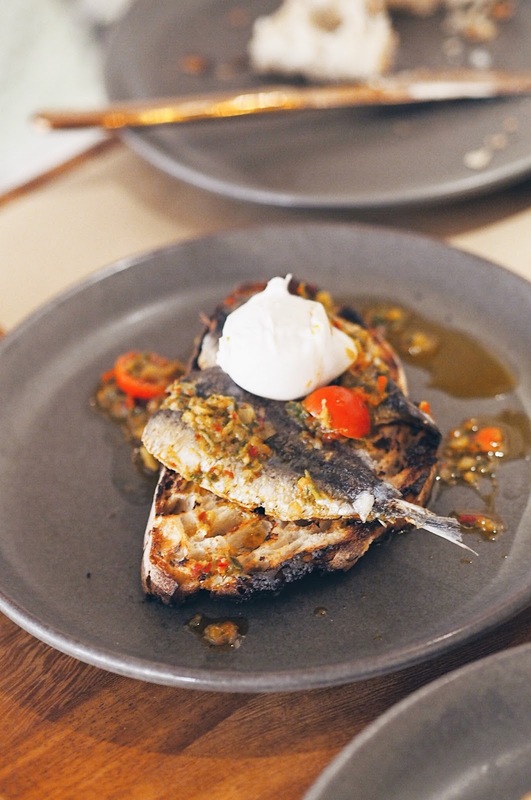 It's a fab new spot called Bucket located over in Westbourne Grove - about a five minute walk from Notting Hill Station - where they're on a mission to serve up delicious, sustainable seafood. 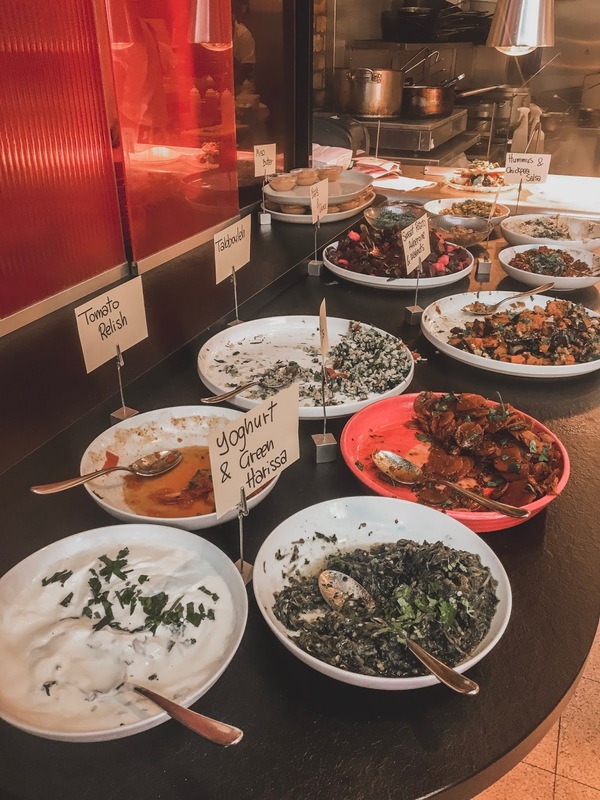 Some of the dishes come served by the Bucket load (hence the name) and are all designed to be big enough for sharing – but equally good enough that you’ll want to try a few to really get a flavour of the menu! We started with a whole array of dishes from the ‘Bites’ and ‘Small plates’ menu. 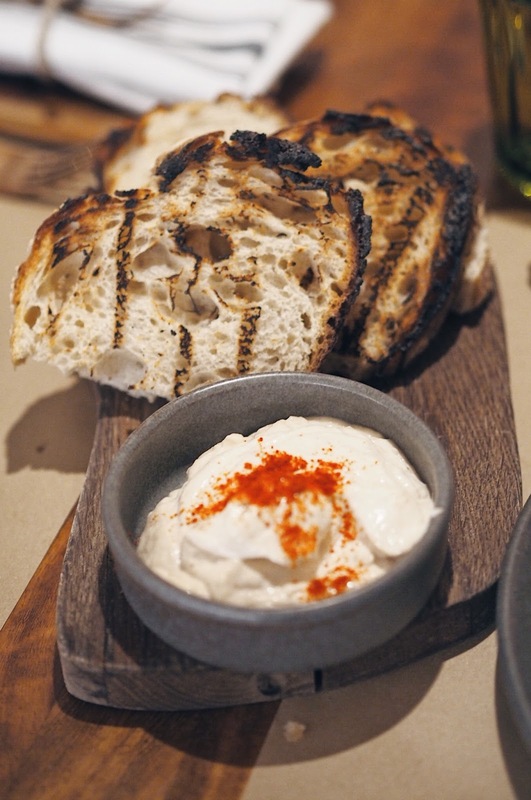 First up was the deliciously creamy Taramasalata (£6) served with a generous portion of warm, home-made bread. Super light and smooth, with a sharp kick of citrus to balance out the delicate cod roe flavour. 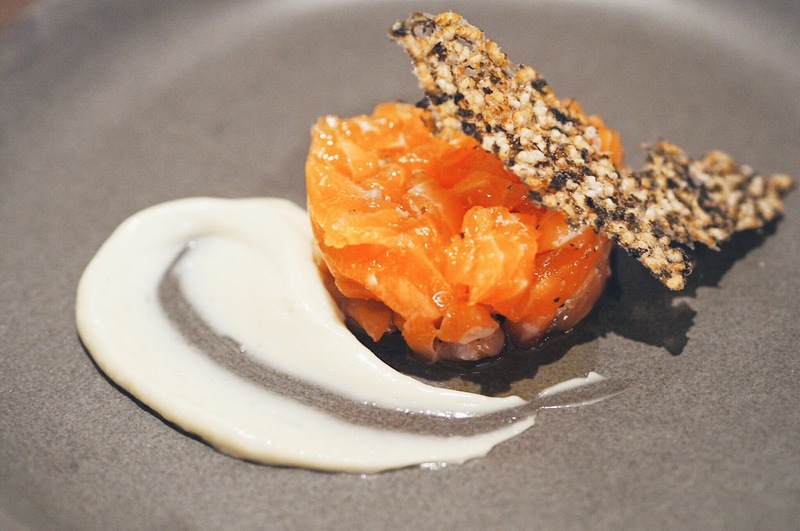 The Salmon Tartare was a special on the night and prepared to absolute perfection. Big, chunky slices of fresh salmon, perfectly seasoned and served alongside a crisp toast. The texture is a lot like sashimi so is a must-order for any sushi lovers! 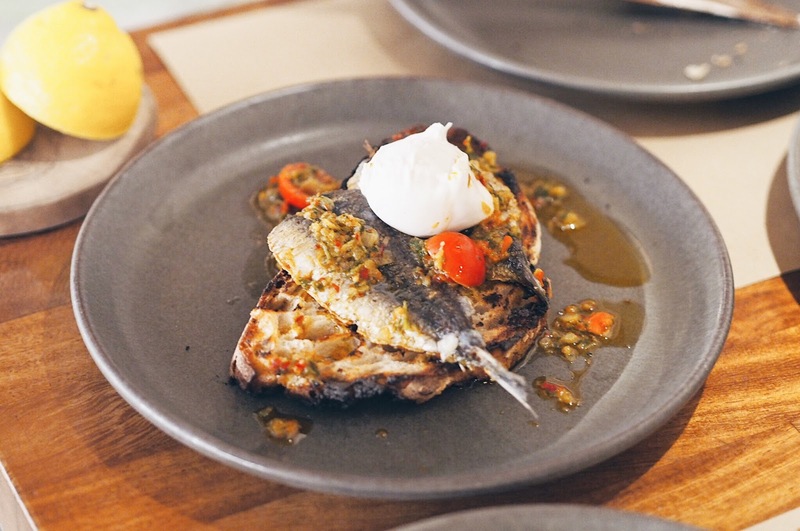 Then was the Sardines on Toast (£7.50) – served with roasted cherry tomatoes and a perfectly poached egg. I felt this dish was a bit lacking in terms of the topping to toast ratio but the flavours were perfect - I just wish that there had been a little more tomato to properly round off the dish! We did however love the Bucket Scotch Egg! The yolk was perfectly cooked, almost set whilst still being runny, and served alongside a delicately spiced red pepper harissa mayo (£7.50). The main attraction though and the whole reason we were here was for the Christmas Dinner offering. 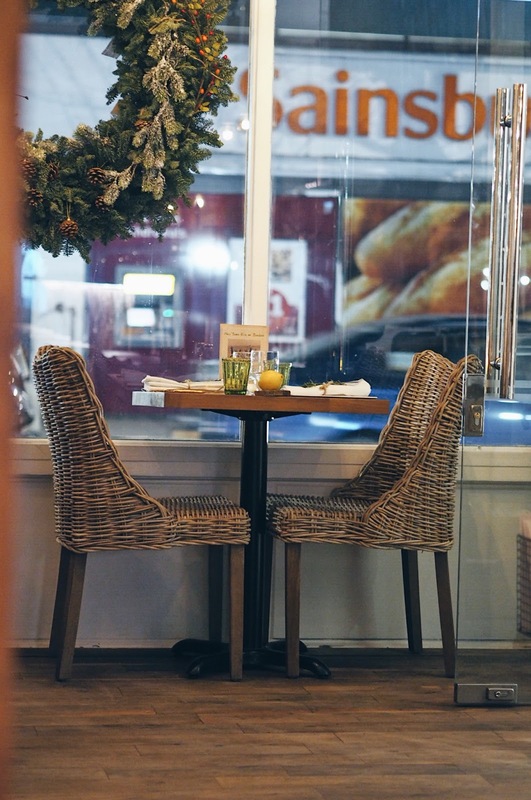 For a limited time only, you’ll be able to get a whole roasted halibut cooked in lemon, rosemary and caperberry butter served alongside prawns in blankets, roast potatoes and brussell sprouts. It's a fabulous twist on a traditional Christmas dinner with every element cooked to perfection! 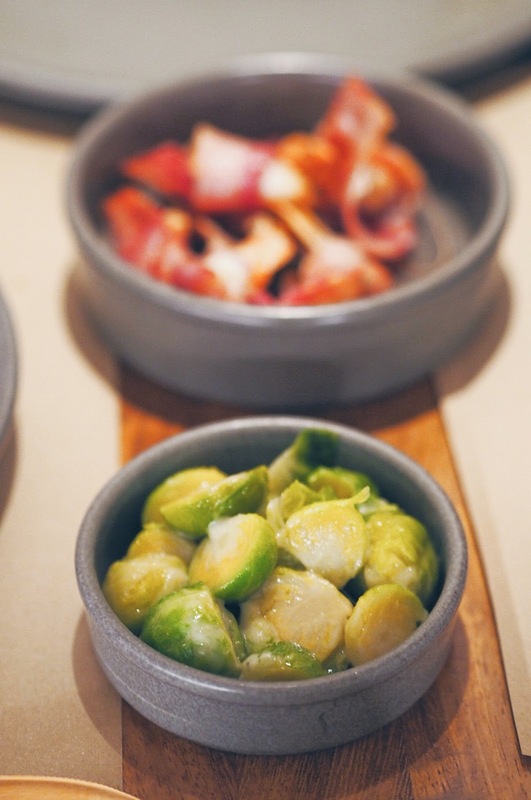 I adored the flakey white halibut, which we'd been presented with at the side of the table before it was cooked for an added element of theatre - and I just LOVED the idea of prawns wrapped in bacon! 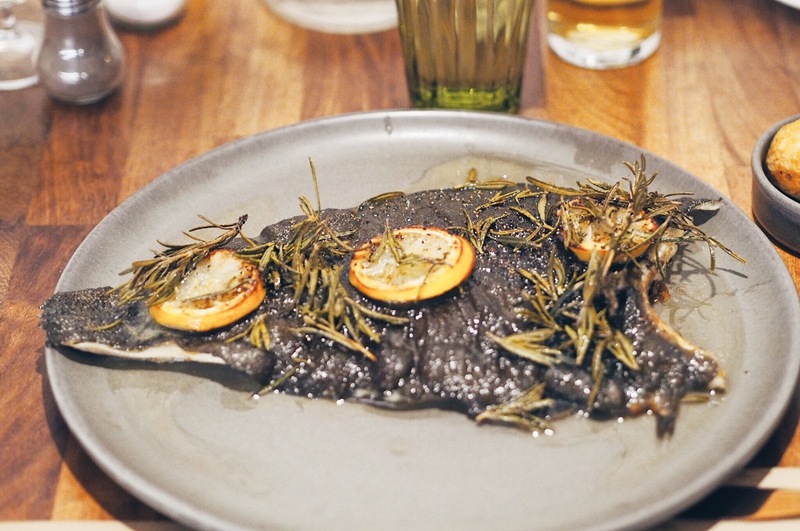 The fish is priced per weight and the sides are £6.50 per person so you’re looking at around £26.50 per person for a decent sized piece of fish which really is incredible value for money. The staff are really helpful when it comes to ordering your fish too, advising the best weight to go for based on your appetite and I have to say, that got it absolutely spot on for us! We saved just about enough room for a dessert - a delicious Apple Crumble (£8) which was large enough to share. 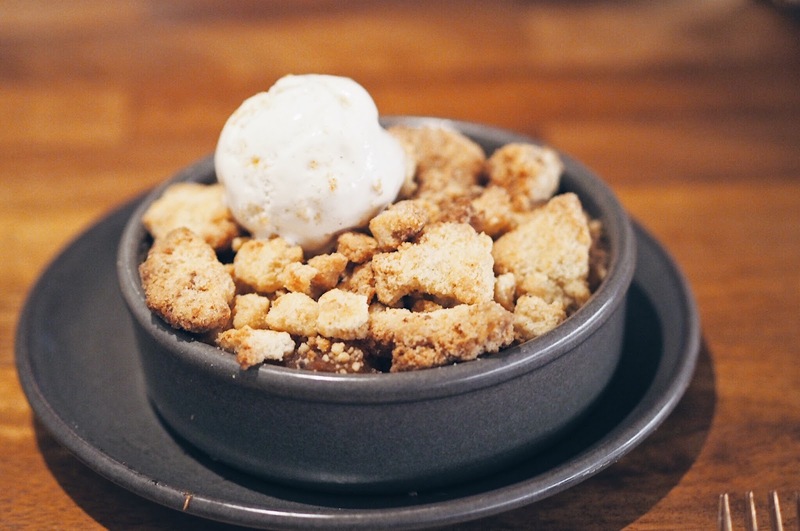 I loved that the topping was made from huge rocks of biscuit rather than fine crumbs - unlike any crumble I've had before and the perfect way to round off a great dinner! If you want to make the most of the Christmas sharing menu, you'll need to be quick as it will only be available until Christmas Eve! I know I'll be heading back ASAP to try the rest of the menu! You’d have to have been living under a rock to have escaped the term ‘hygge’ over the last few years. It’s a popular Scandinavian concept which exploded onto the internet and is all about the art of being cosy – and it’s definitely something I can get on board with! Hygge is all about creating a warm, cosy living environment and where’s more important to get snug than the bedroom? 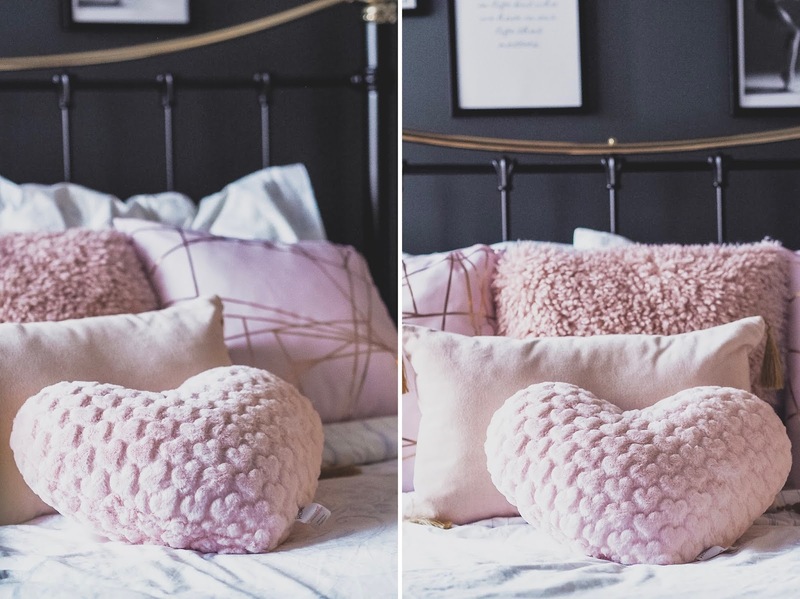 Now the temperatures are dipping and we’re marching ever closer to Christmas, I wanted to round up all the simple little touches you can do to inject some hygge into your bedroom ready for those chillier night! The bed is the focal point of any bedroom so where better place to start? Obviously you’ll want super soft sheets and warm, fluffy cushions to create the ultimate sleeping environment but don’t forget the mattress itself! Your mattress is probably the most important aspect of getting a good night’s sleep and the one a lot of us neglect the most! By investing in a decent mattress, you’re setting yourself up for a good night’s sleep which comes with a whole host of wellbeing benefits like - improved concentration, reduced stress and an overall better mood.We were recently sent a Leesa mattress to try out and it’s absolutely transformed the way we sleep. The beauty behind this particular mattress lies in its three foam layers, that adjust to your body to offer the ultimate support and comfort, and reduce the chance of overheating at night. Tom and I used to get really broken sleep, waking up at different hours through-out the night, but since we’ve changed over, we both manage to sleep soundly through till morning! 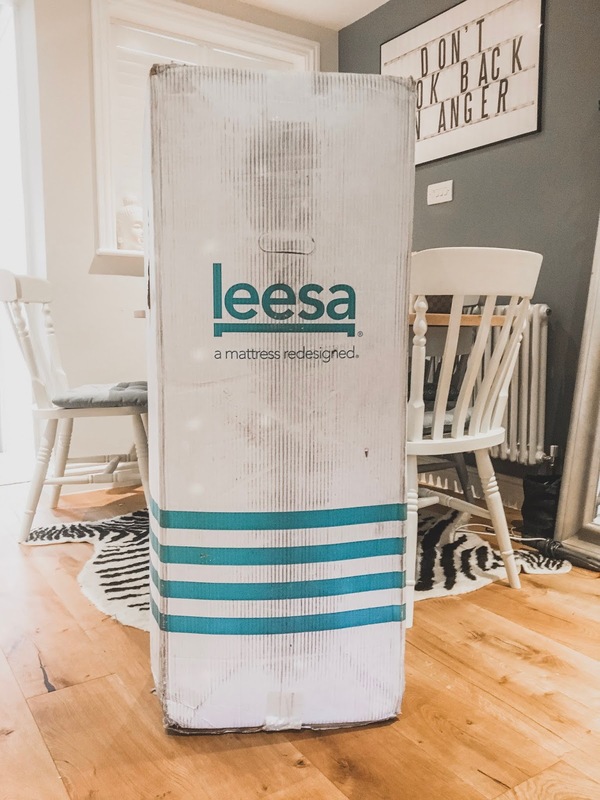 It’s super simple to order a mattress from Leesa too – you just go online, place your order and your mattress will be delivered in an impossibly compact box (can you believe they get a mattress in here?!). Once unboxed, it expands to full-size and is ready for you to sleep on that very evening! It’s absolutely changed my whole sleep experience and definitely the number one place you need to start if you’re looking to create a better sleep environment for yourself! Hands up who else is guilty of getting into bed and spending half an hour just scrolling through Twitter and Instagram before bed? Nothing disrupts your cosy vibes like online drama or fretting over late-night work emails. To help drift off to sleep, you should try to limit the amount of blue screen-time before bed so why not turn your bedroom into a 'no-phone' zone. Obviously, a lot of people rely on their phones for their morning alarm so it’s fine to keep it by your bedside, but try to refrain from reaching for it out of boredom. Now you’ve got the bed right, you’ll want to add the right finishing touches to create a truly relaxed environment. Fur cushions and rugs are the simplest way to add comforting texture to your bedroom and big chunky knitted blankets also help to dial up the cosy factor. Try to keep colour schemes simple by looking for shades within the same colour palette or either opt for warming tones and dark accents to add drama and mood to the room. If we’re kicking phones out the bedroom, let’s also ban wearing your everyday clothes too! The easiest way to get cosy is to change into your PJs the moment you get through the door! I spend the majority of my time at home in my pyjamas so I find this one easy but it’s super simple. Just limit your everyday clothes for the living room or when you actually need to leave and only lounge in your comfort wear when you’re in the bedroom! Is there anything more relaxing and snug that some gorgeous scented candles burning away? Candles provide soft, natural light which feel so much more snug than having your main bedroom light on (plus it’s great for your leckie bill!). 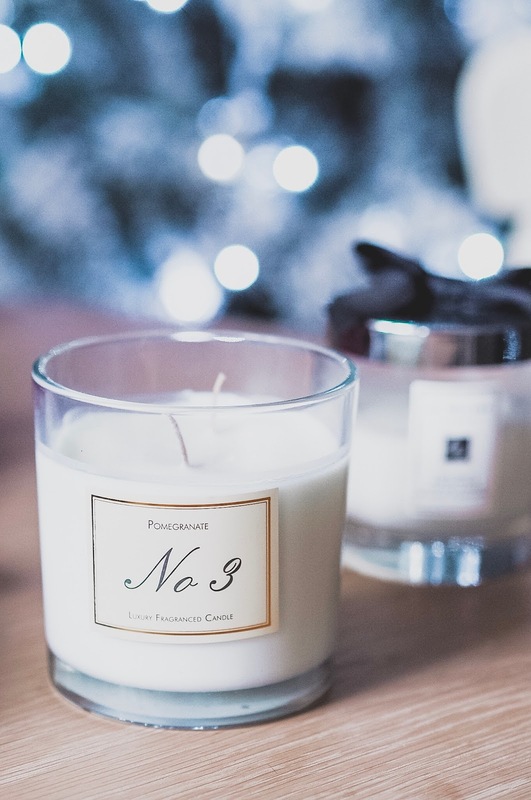 Dot them in clusters of 2-3 on shelves or on the window sill to inject some real hygge comfort to your bedroom and go for scented candles for added cosiness! 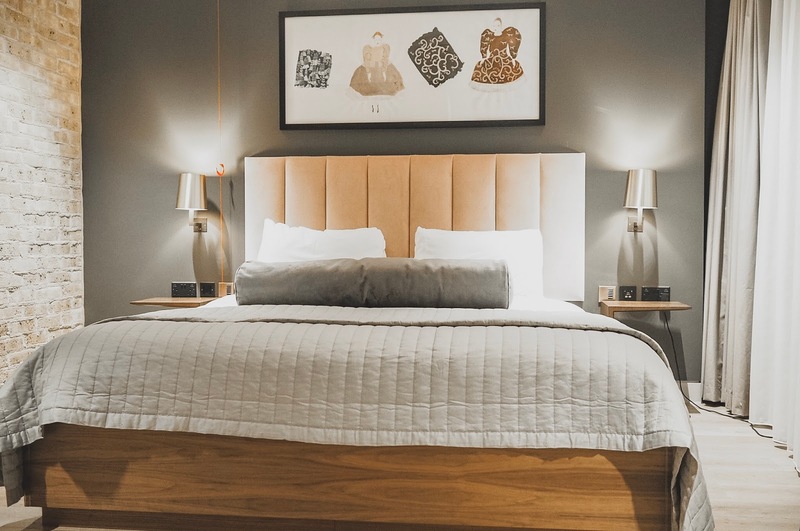 If you’re thinking of changing your mattress, make sure you visit the Leesa website to learn more about their signature bed. 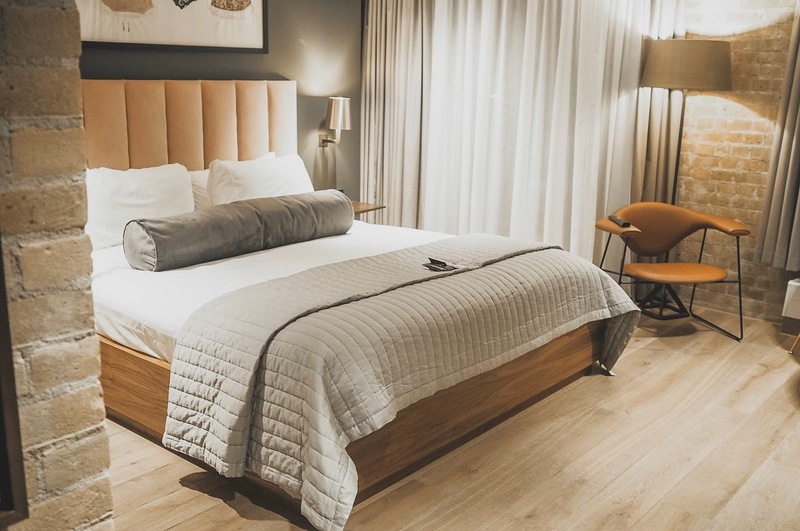 You will also be able to sleep well in the knowledge that you’re helping to give something back, which is built into the company’s DNA, as Leesa donate one mattress to charitable causes, for every ten sold! I love trying foods and flavours from all over the globe – BUT, you really don’t get better than good old British cooking though, do you? Steak. Roast Beef. 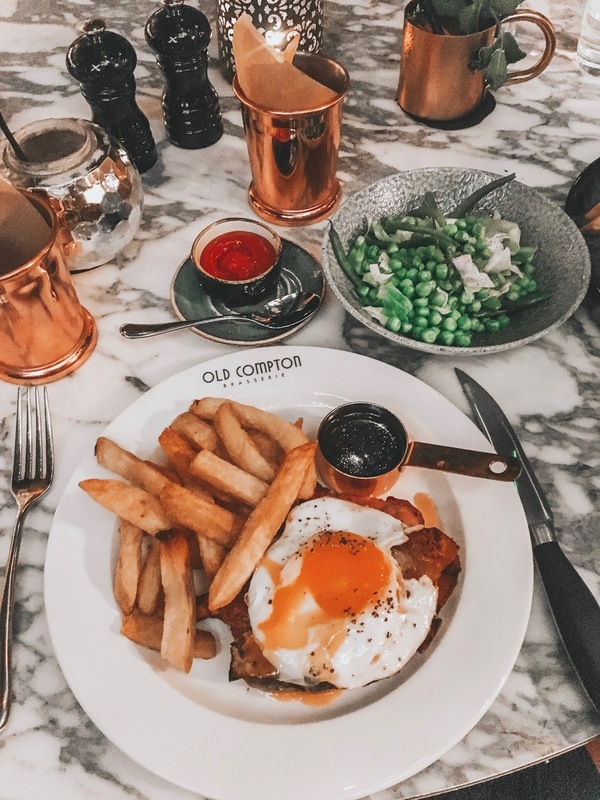 Ham, Egg and Chips – come on, I dare you to name a more iconic trio! 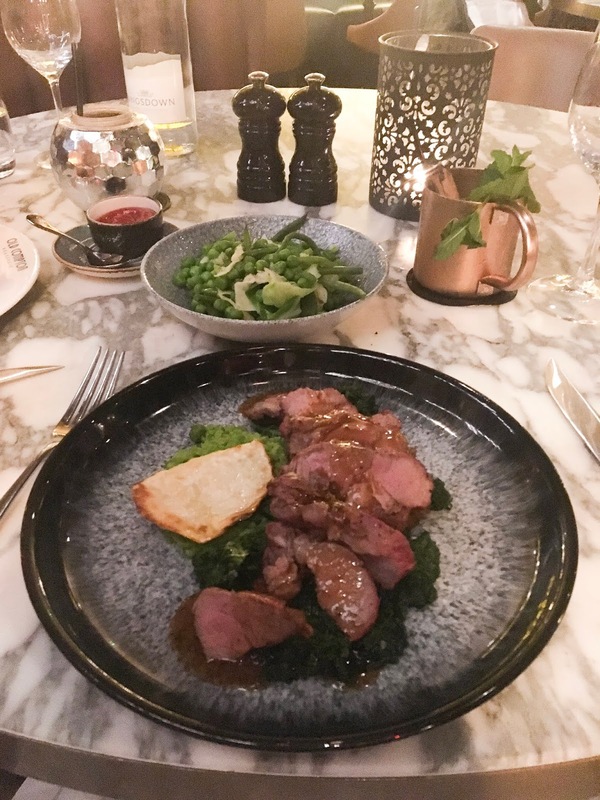 I’ve fallen in love with a new British Brasserie in Soho so I’m excited to tell you guys all about it. It’s down on Old Compton Street and aptly named the Old Compton Brasserie. 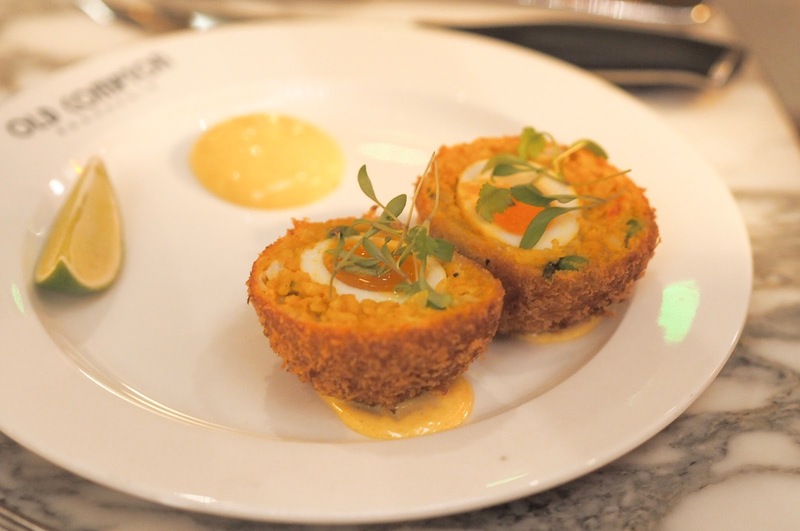 The menu is based around British classics but with an elevated twist. There’s a killer cocktail menu too – themed around true Soho legends like Ronnie Scott and Soho Pam. The Regina Fong is simply FABULOUS and even arrives at your table in a disco ball! The restaurant itself is gorgeous too. Super spacious, with street art on the walls and a huge wrap around bar up front. Towards the back you’ve got incredible industrial style beams and huge leather banquettes where you can hide away while you enjoy your food. We kicked off our meal with two of the highly recommended starters. 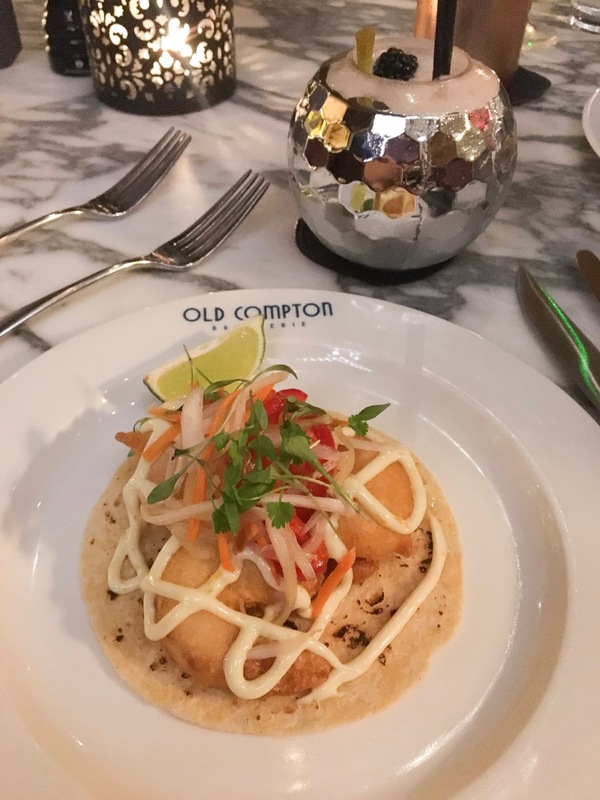 Mine – the tempura prawn taco (£8.50) – was a huge king prawn deep fried and served with crunchy pickled vegetables and a tangy citrus mayo. 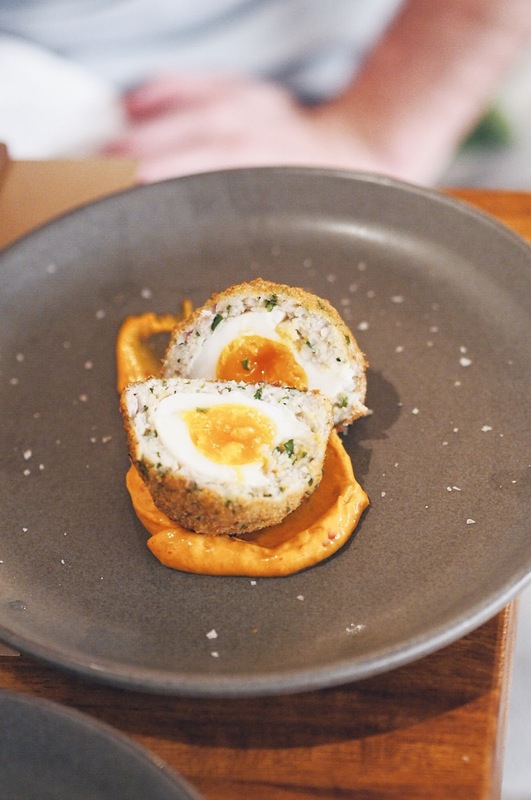 Tom went for the Kedgeree Scotch Egg (£5.50) created with delicious spiced chunks of fish encasing a perfectly cooked egg, rather than the traditional meat filling. The outer coating had the perfect bite to it and was all beautifully brought together with the creamy curry mayo - a fab dish for lunch or dinner! For mains, I went for the classic Ham, Egg and Chips (£15). A proper British classic - I love the fact you’re served a bacon chop here rather than a gammon steak which made the whole dish feel so much more premium. For sides, we shared an extra portion of Triple Cooked Chips (£4.50) - because one is never enough -and some buttery greens (£4.50) in an effort to restore some balance! 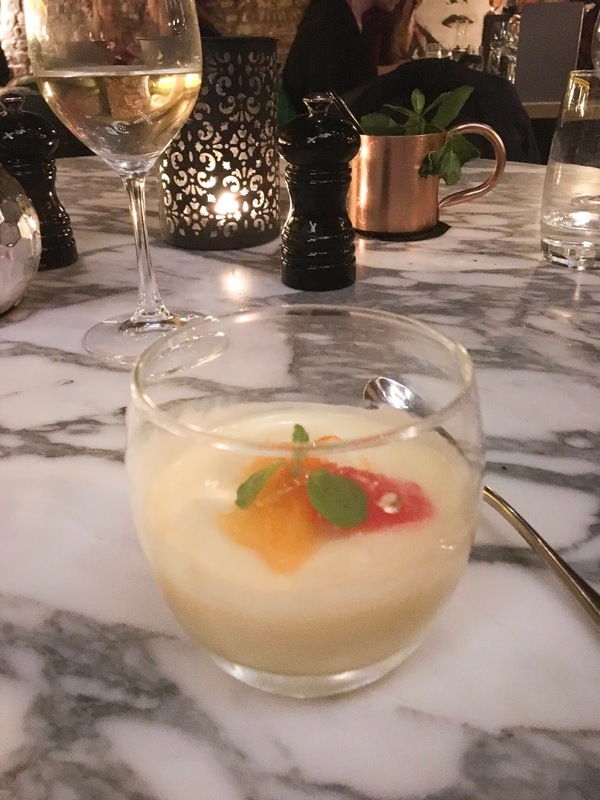 We finished off the evening by sharing a Lemon Posset before heading off into the bright lights of Soho. The restaurant is open all day so you can book for breakfast, lunch and dinner - and it also makes a great spot for a few drinks after work! I definitely recommend getting yourself down there ASAP! Now the clocks have gone back, I am FULLY committed to winter dinners. Warm, comforting bowls of goodness, perfect for seeing you through those cold, winter nights ahead. 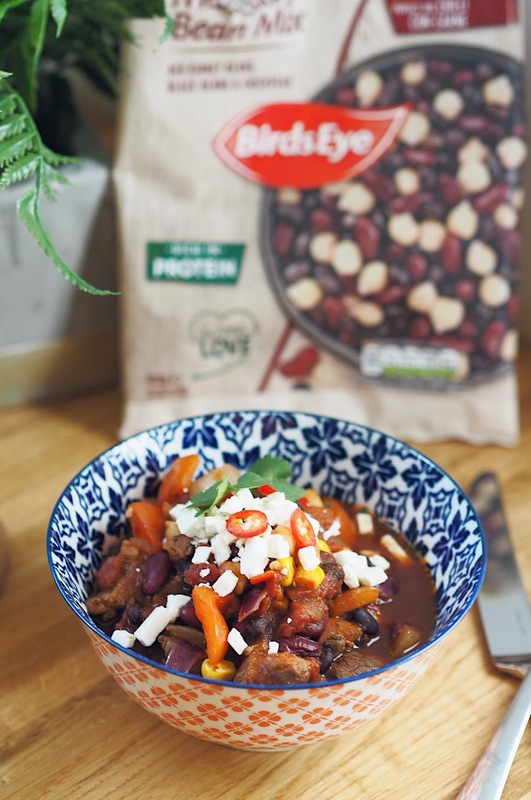 And you don’t get much more comforting than a big ol’bowl of hearty chilli, now do you? 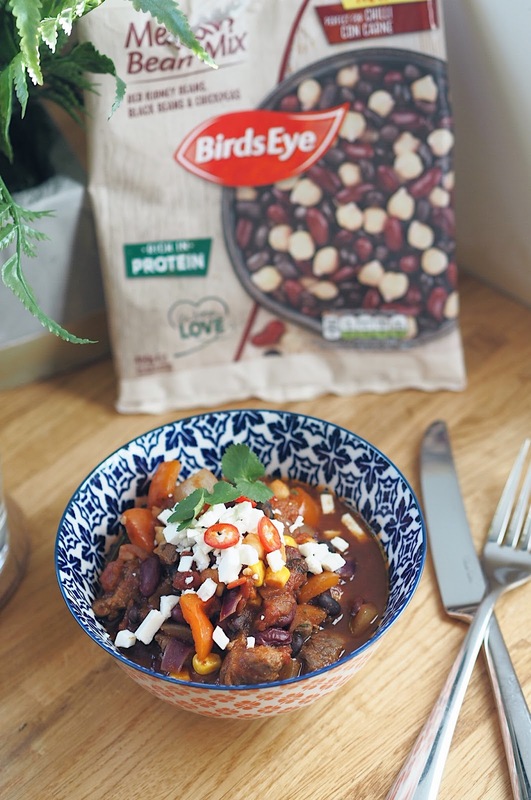 Now, I LOVE a good beef chilli, it’s one of my go-tos at this time of year – and when Birds Eye challenged me to create a recipe using their fab range of pulses – I knew this was the dish that I wanted to share. For this recipe, I’ve used big tender chunks of beef (instead of mince) which I think helps add a real depth of flavour and texture to the dish. 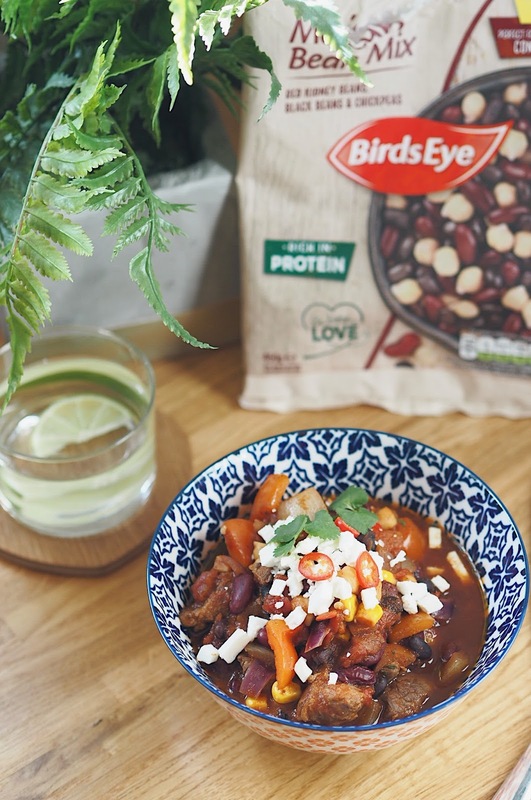 I also love adding pulses to my chilli to help bulk it out and pack in loads of extra nutrients - but rather than reaching for cans of beans, I've used the Birds Eye Mexican Bean Mix for this recipe and they are just SO easy to use! 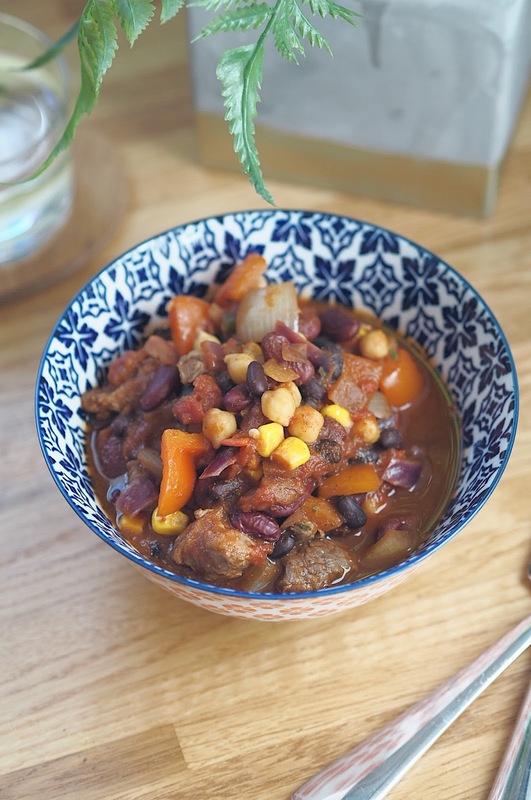 I've always been a big advocate for frozen veg and pulses – unlike their tinned or dried counterparts, freezing helps to lock in all the natural goodness and that’s exactly what these babies are packed with! They're a rich source of protein, contain plenty of fibre and they even count toward one of your five a day! 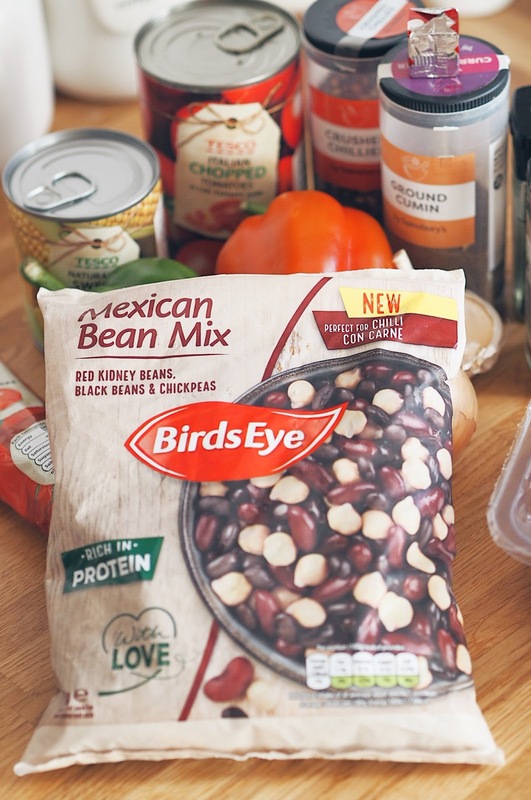 The Mexican Bean Mix contains a blend of red kidney beans, black beans and chickpeas – and what I love is that they're ready to cook straight from frozen. They only take four minutes to cook and there's no soaking or draining, just straight out the bag and into the pan. That means less time spent faffing with ingredients and more time spent actually creating recipes - dreamy, right? 3. Next add your spices, followed by the stock cube, tomato puree and tinned tomatoes. Add 300ml of hot water then pour in your Birds Eye Mexican Bean Mix and sweetcorn. 4. Give everything a good stir then add your beef back to the pan and bring the heat to a gentle simmer. 6. Remove from the heat and enjoy! Perfect served on its own with crumbled feta and fresh chilli, with rice or in a wrap! There's three variety of Birds Eye Pules - Chickpea and Spinach Mix (which would be great for curries), Italian 3 Bean Mix (hello sausage casseroles) and the Mexican Bean Mix which I've used above. You can pick up a bag in the frozen aisle at big Tesco & Asda stores and Ocado for just £2.00. November 5th - Bonfire Night! Not only does today's date mean fireworks, but it also means we are OFFICIALLY entering the BEST time of year. It's time for Pumpkin Spice Lattes, (faux) fur coats and Christmas music (can you tell I'm excited for December 25th already?). I love this stretch from Bonfire Night up until Christmas and going out to watch a display is one of my favourite ways to truly kick of winter celebrations! 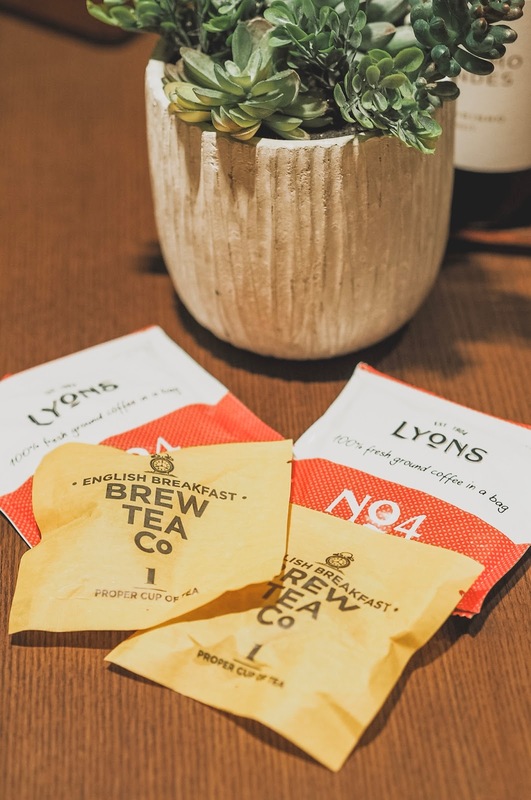 Now, whether you're planning to get cosy and watch the fireworks from the comfort of your sofa, or you're heading out to a display, I've rounded up the perfect ways to get you warm this Bonfire Night! If you're planning to head to a display, you need to wrap up warm! It's suddenly got SO cold, so if you're braving the elements to go stand in a field for a few hours, you're going to need to master the art of layering! A turtle-neck body, under some thick black leggings with a cosy knit jumper and my trusty teddy coat is my go-to look for keeping warm. Team that with a pair of heavy duty biker boots and a beret and you're good to go! My secret weapon for keeping my hands warm when I'm outdoors? HotHands. They're single use heat pads which are designed for keeping your fingers and toes warm in the cold! You just open the pack, then they start to heat as soon as they're exposed to the air - within 10-20 minutes, you've got yourself a nice warm little bean-bag that will keep you toasty for most of the evening! You can buy them from Amazon for around £7.50 for two packs of five and are an absolute life-saver when you're standing out in the cold! Autumn dinners are the best. They're stodgy, comforting and perfect for warming you from the inside when it gets chilly! On Bonfire Night, there's no better dinner than Chilli Cheese Hot Dogs! Gather all your mates, get a big pan of chilli on the go and pile up your hot dogs while you enjoy the fireworks! Proper winter warmer food! Talking of winter warmers - Bonfire Night usually marks the first Mulled Wine of the season for me but if you're looking for a good alcohol free alternative (because Monday is a School night after all), go for a luxurious hot chocolate, piled high with whipped cream and marshmallow. Perfect for keeping you toasty from the inside! What are you plans for Bonfire Night? I'd love to hear how you'l be spending it in the comments below! I have to be honest and say that when I visited By Chloe, I came here, very much with the opinion that I would hate it. 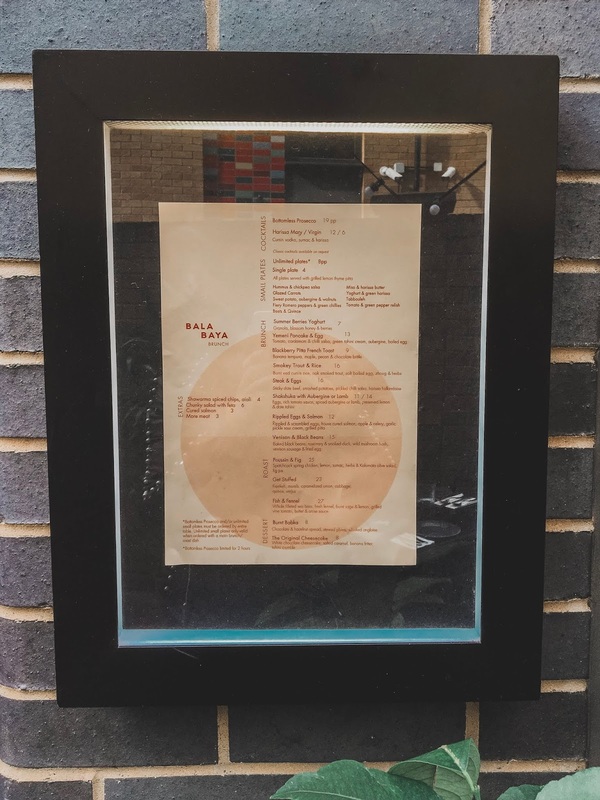 I’d heard some pretty scathing reviews - mainly that the food here is all style and no substance – BUT I have to say, I was actually…impressed. Now, you’ve probably heard of By CHLOE by now – or at least seen it! It’s a vegan ‘fast-food’ restaurant that’s been plastered all over Instagram since it launched in Covent Garden back in February (you know the ‘Guac Save the Queen’ mural I’m talking about). 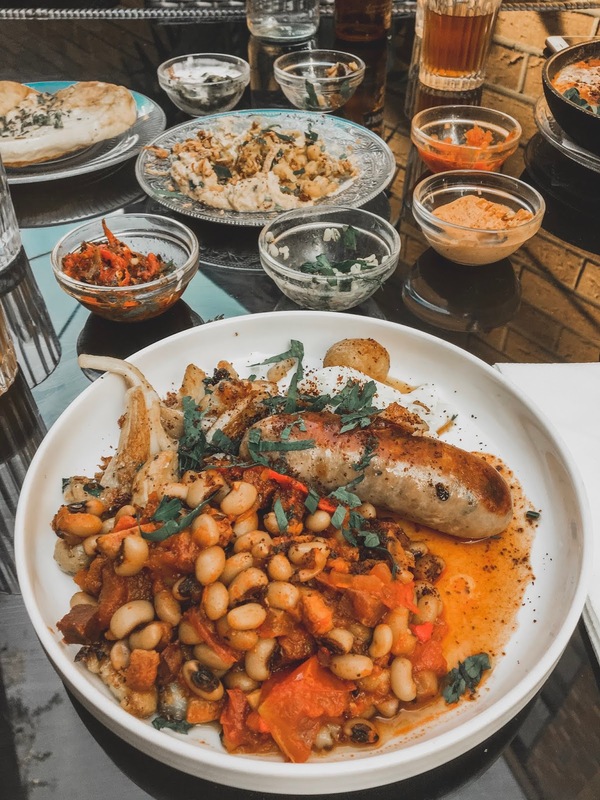 Originally from New York, it’s HUGE within the vegan community but also with a growing number of meat-eaters, mainly for the fact that they’re serving vegan ‘comfort’ food, that’s actually been made with carnivores in mind. So what exactly does a carnivore eat in a vegan restaurant? The Pesto Meatball Sub is a definite order. Instead of traditional meatballs, these are made from pesto, portobello mushroom and veggies, packed into a potato sub roll and slathered with delicious marinara sauce and basil pesto. The Quinoa Taco Salad was really good too. Chopped romaine lettuce, topped with spicy seitan 'chorizo', black beans, sweet corn, avocado, tomato and tortilla strips. So fresh and packed full of flavour! I'd also recommend a portion of the Air Baked Fries and the Mac & Cheese - which is actually made from a sweet potato & cashew 'cheese sauce' then topped with shiitake 'bacon' and almond parm! It's by no means going to convert me to vegan life BUT it's most definitely better than I'd originally expected! The one thing I would say though, is to visit the Tower Bridge restaurant. It's far less busy and the service is a lot better than the Covent Garden one! Hands up, who loves hummus? Now I’m expecting to see all your hands in the air here because everyone loves hummus, right? Well, for ALL you hummus lovers, I’ve found the perfect spot for your next brunch and it includes (dun, dun, dun) UNLIMITED hummus. Yep. Unlimited dishes of creamy, golden hummus – ready for scooping up with warm, fluffy bread. (I bet you're wondering when I'll stop saying hummus). 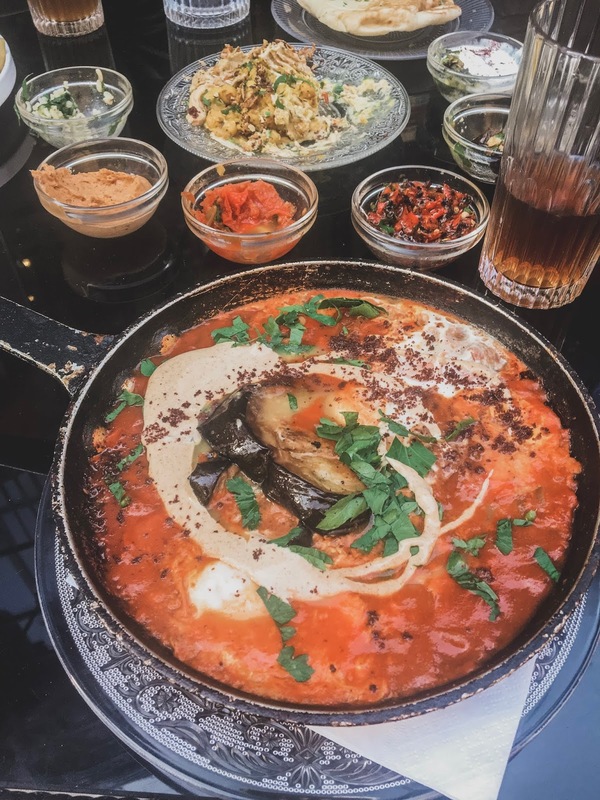 You'll find it down at Bala Baya, an incredible Tel Aviv inspired restaurant down by Bankside, as part of their weekend brunch offering! 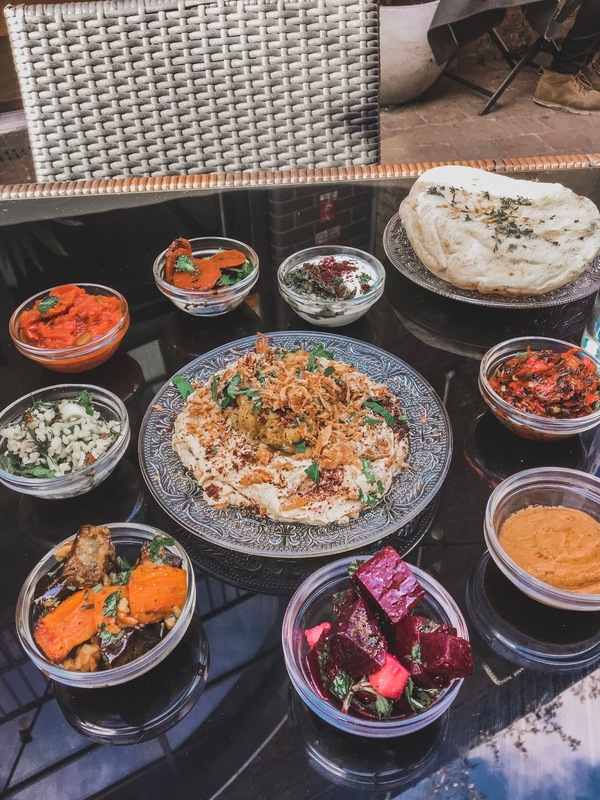 For £8 per person, you can opt for unlimited small plates so you get a taste of all the mezze on the menu. The only catch being that if you go for this option – you have to order a main course (as if that’s ever a bad thing). I suggest you kick things off with one of their incredible Gazzioni cocktails. 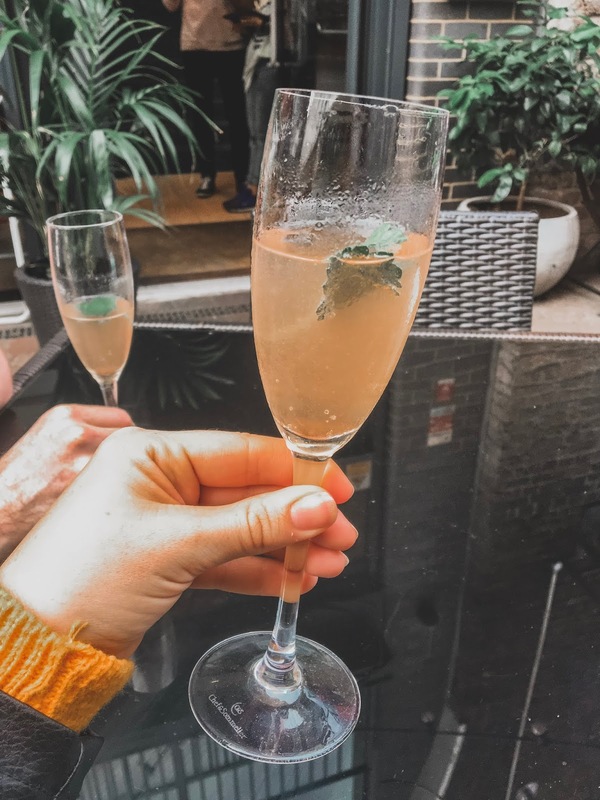 There’s some interesting flavour combos on the menu which are surprisingly delicious – my personal recommendation being the sweet and refreshing Watermelon, Parsley and Prosecco. Next you’ll want to tackle your small plates. You don’t HAVE to go for the unlimited option – if there’s any dishes that particularly take your fancy, you can just order a larger portion – but you know me, I like to get a little taste of everything. There’s a whole host of delicious dips including hummus & chickpea salsa, miso & harissa butter and tomato & green pepper relish which are perfect for slathering onto freshly baked pitta. 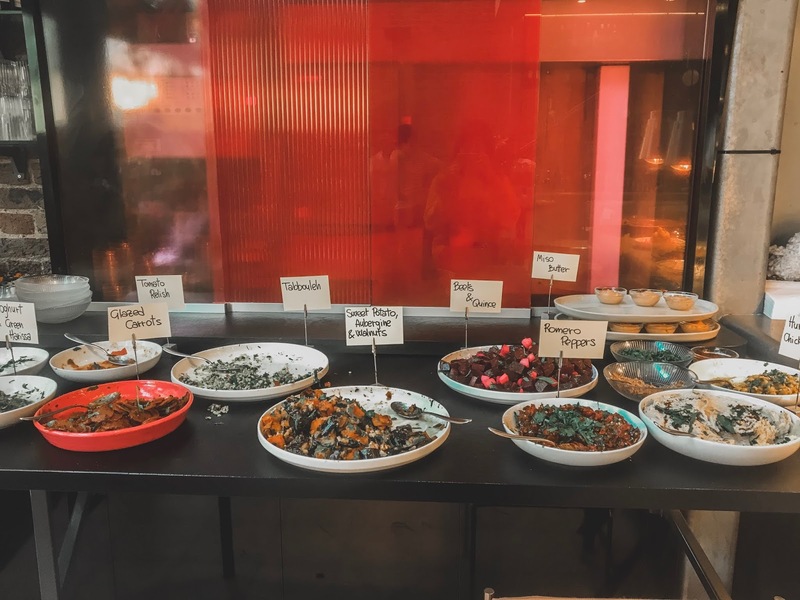 You can also nibble on portions of grilled fiery Romero peppers, sweet potato, aubergine & walnut, buttery glazed carrots as well as grilled beetroot. Oh and not forgetting the tabbouleh salad! As I said before, every dish is bottomless so you’re free to order as many as you want – just remember that you’ve got to save room for your main. Tom went for the Venison & Black Beans which looked incredible. Baked black beans, cooked together with rosemary & smoked duck, piled onto a wild mushroom hash and served with a venison sausage & a perfectly fried egg. I went with my old favourite the shakshuka - which never lets me down. Two eggs baked in a rich tomato sauce with spiced aubergine and preserved lemon, all drizzled with a date tahini. Simply delicious. Just bear in mind that it's HUGE so I would go easy on those starters if you're ordering this one! So what do you think? Looks really tasty, huh? 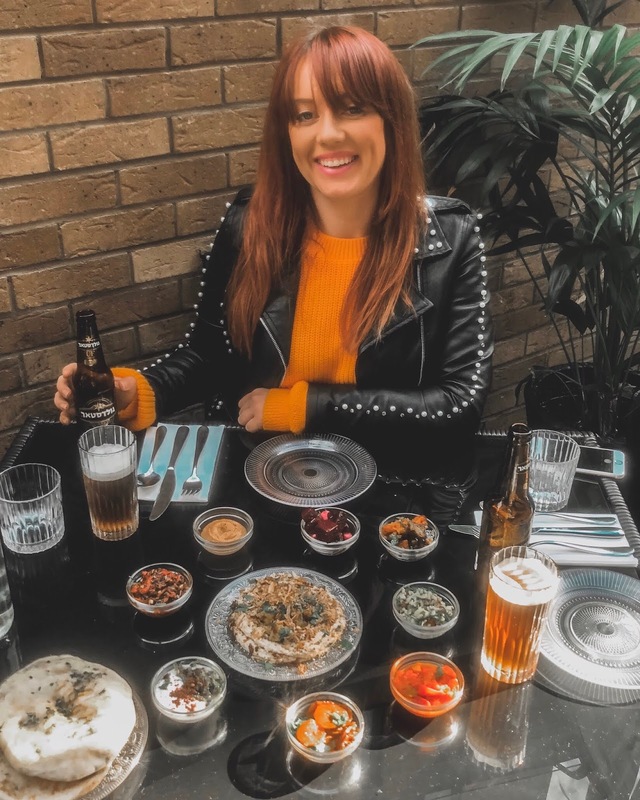 If you're planning on heading down, I'd recommend booking a table or getting there early as it starts to fill up pretty fast - and no-one wants to miss out on unlimited hummus! Living *just* outside London in leafy Beaconsfield can be an absolute pain sometimes. I live close enough that's its easy to get a train home after a night out, but far enough that it feels like a LOT of effort after a night of cocktails or a fancy dinner. Not to mention the fact that the last train out of Marylebone leaves at five past Midnight and often results in a mad sprint down the platform! What I really need is a home away from home in London for those big nights out - and well, in step Native! 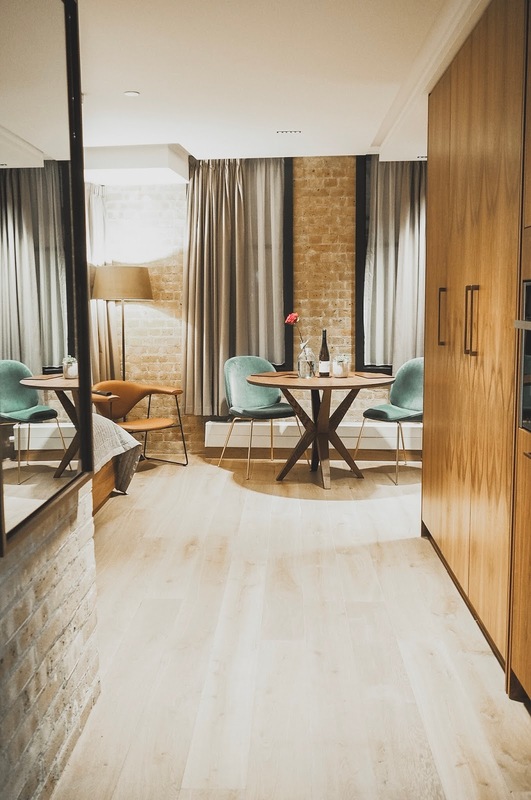 Native is a group of aparthotels offering a home-like base to stay in some of the UK's best cities including London, Manchester and Glasgow. 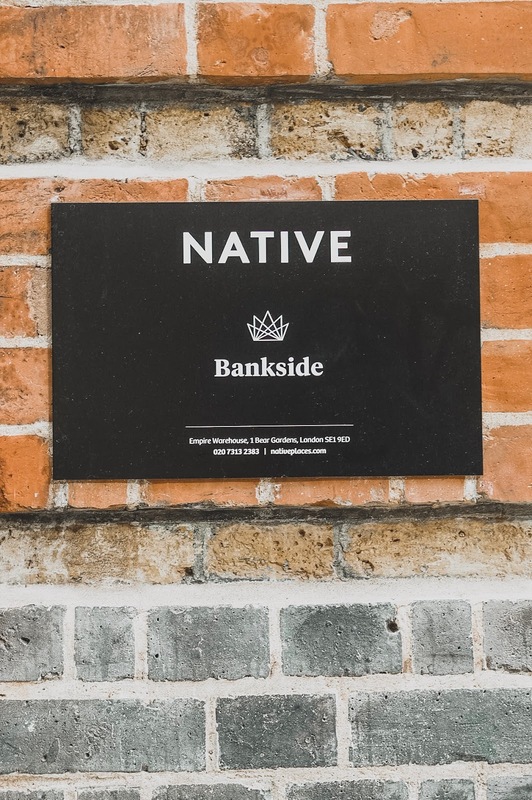 Tom and I were recently offered the chance to stay in one of their newest properties in Bankside and we absolutely jumped at the chance! 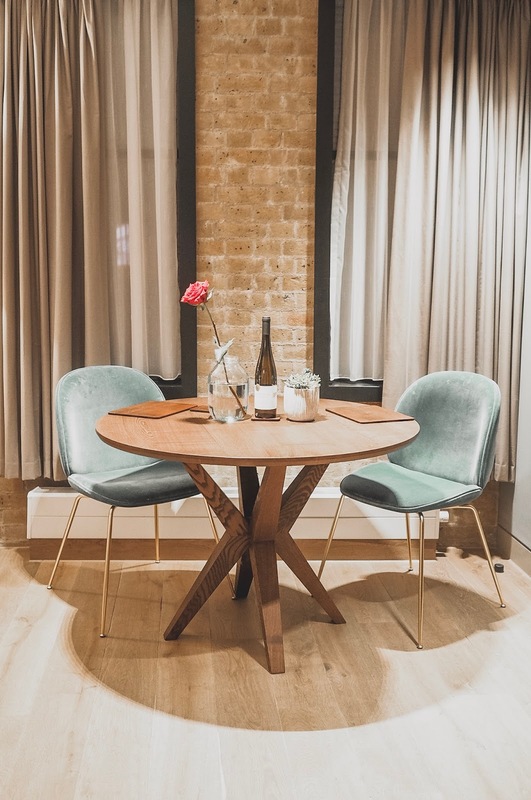 THE LOCATION: The apartments are tucked away in the historic Bear Gardens, right in the heart of buzzy Bankside, just behind the banks of the River Thames. 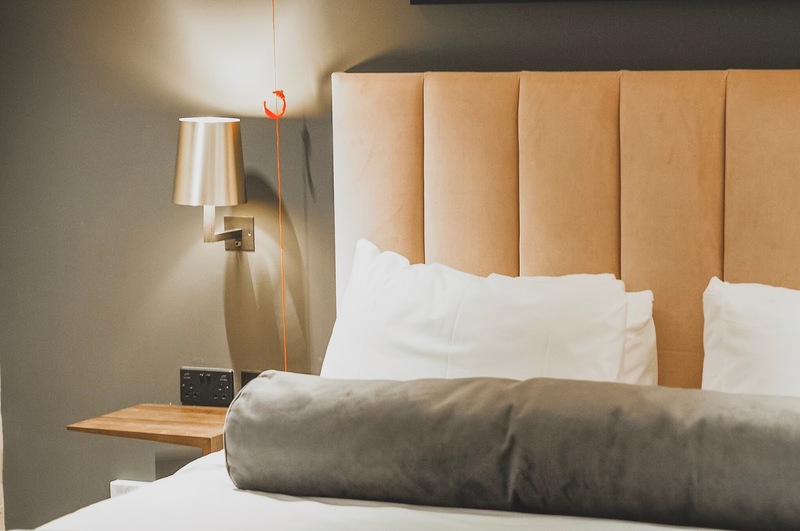 You're just a few minutes walk from some of London's best loved hotspots like The Tate Modern, Borough Market and Shakespeare’s Globe Theatre, making it the ideal base for a stay-cation in the capital. 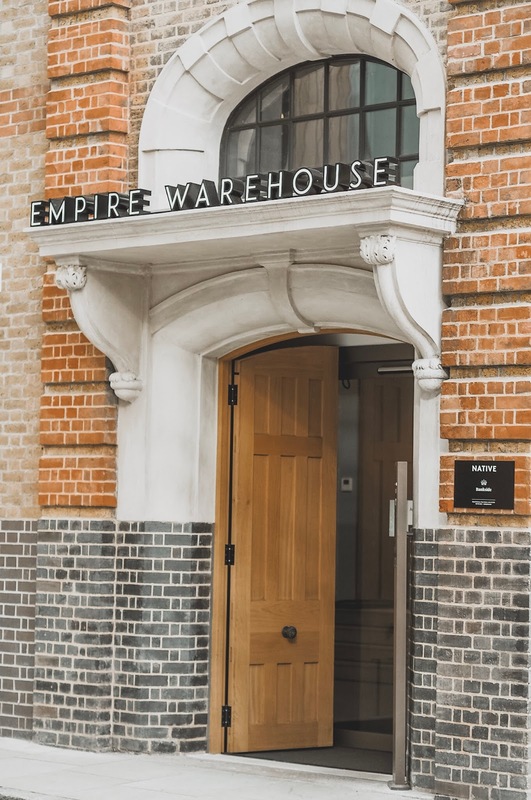 The building itself is located in a former 18th century tea warehouse which has been transformed into 75 stunning luxurious apartments and features the most incredible exposed brick and steel interiors. THE ROOM: We stayed in a 'Premium Studio' (which start at around £150 per night) and it was absolutely gorgeous! The rooms are really spacious - ours featured a huge open-plan bedroom, kitchen and dining area (and bathroom obvs) which had more than enough room for a couple. 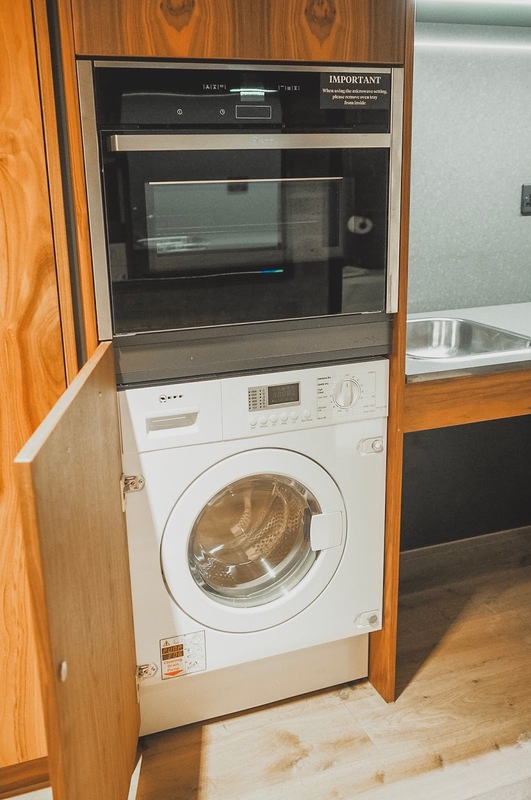 All the apartments are self-contained and fitted out with an oven, hob, dishwasher and even a washing machine so you really do have your very own home-from-home - especially if you're visiting from abroad or staying for a prolonged period of time. I absolutely fell in love with the interiors too! All the rooms are really light and bright and manage to get the right balance between modern (with touches of dark slate greys and millennial pinks) whilst keeping some of the older historic elements of the original building. There's plenty of well thought-out extras in the rooms too. 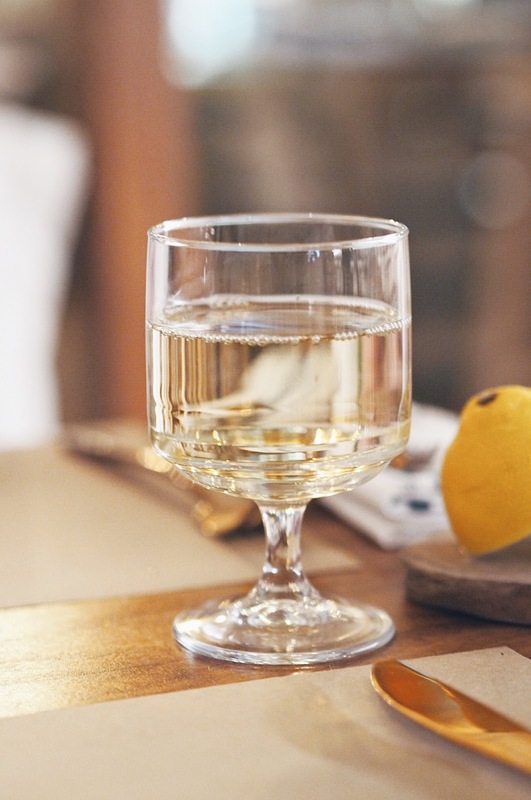 There's a hair-dryer and ironing board in the bedroom cupboards and the kitchen is fully stocked with wine glasses, corkscrews, pots, pans and cutlery. 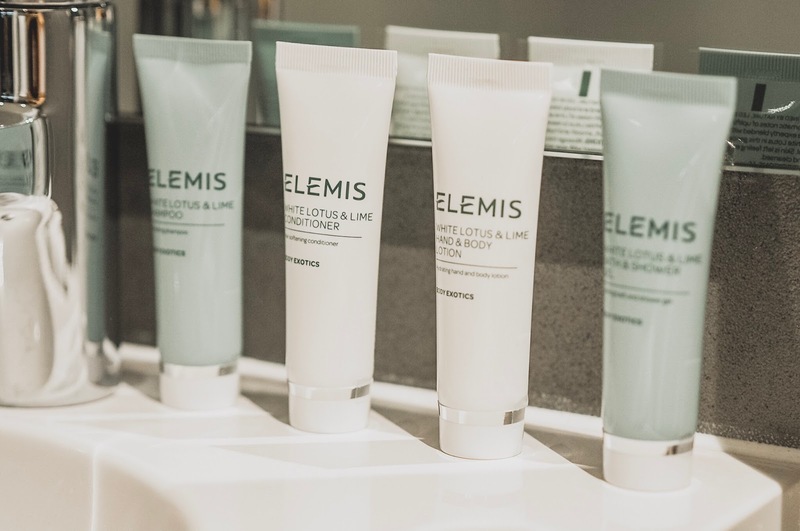 There's also a selection of delicious tea and coffee to enjoy and premium Elemis toiletries in the bathrooms too! 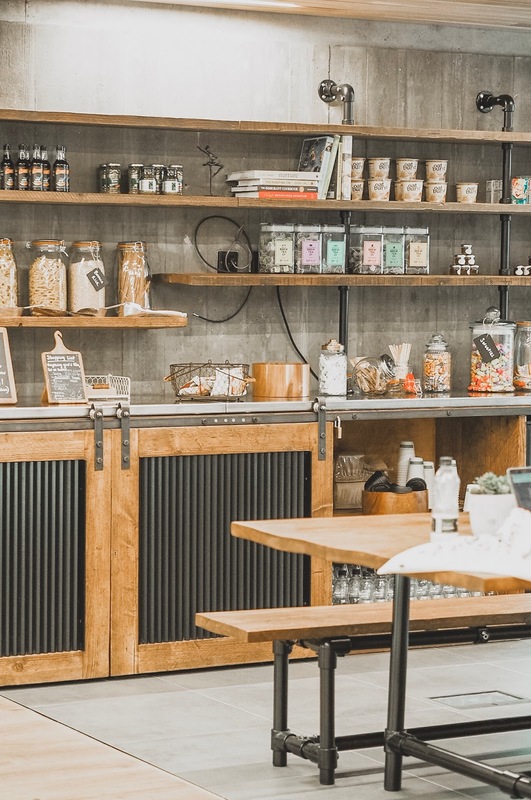 What I loved about Native was how the whole place has a real communal vibe with plenty of open-plan living areas where you can chill out, eat and socialise with your fellow residents. The team at Native really aim to bring a neighbourly feel to the apartments so it feels a lot more homely than being in a standard hotel. 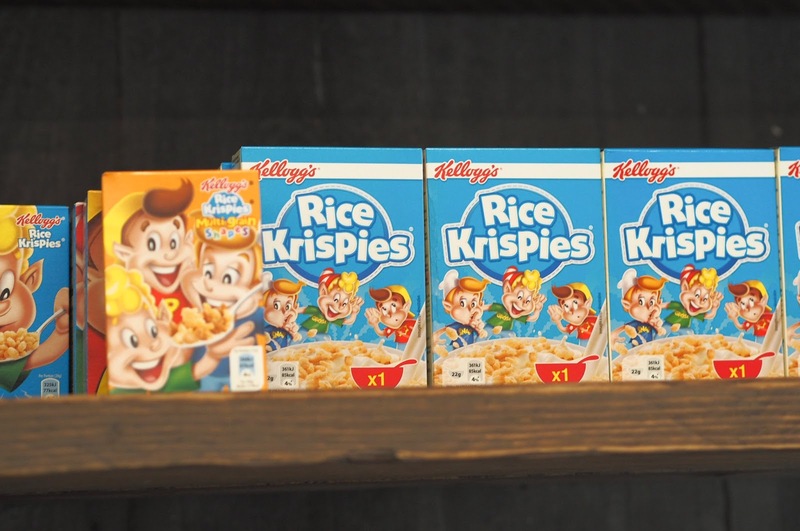 One of my favourite parts is the pantry. 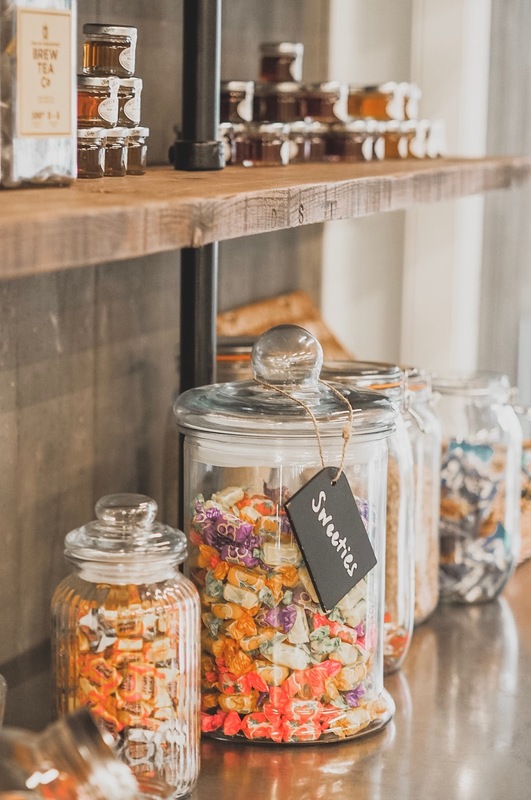 Located up on the second floor, it's an open space where you can help yourself to an assortment of food and drink to bring back to your apartment to cook. 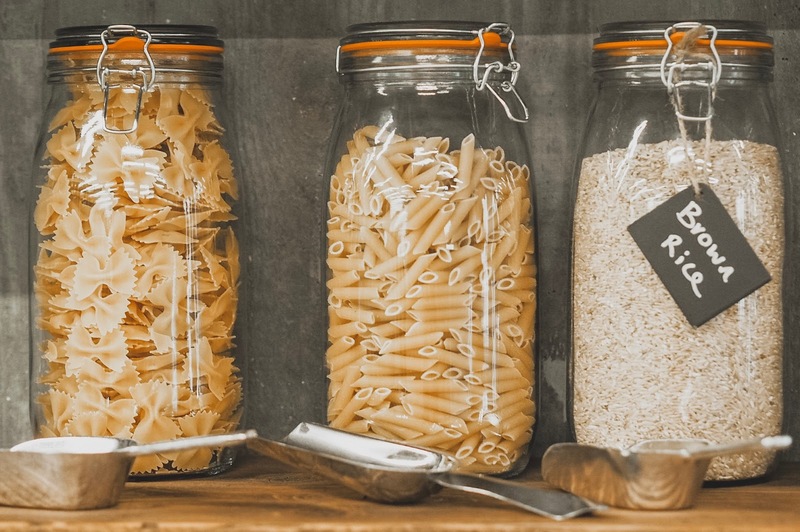 There's jars of pasta, tins of tomatoes, pesto, cereals and even sweeties - all completely complimentary for you to enjoy through-out your stay. 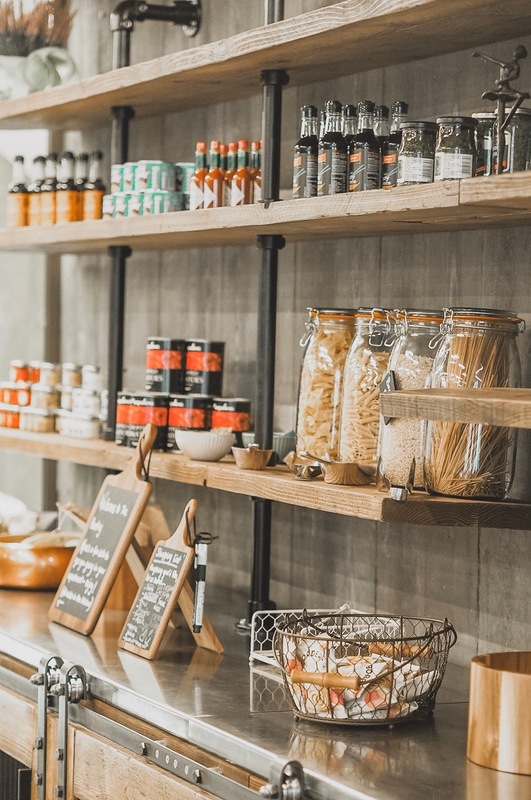 If you don't want to sit in your room to eat, you're free to take a seat at the dining table to enjoy your food, and there's even a shopping list where you can add your suggestions for what else the Native team should stock the pantry with! 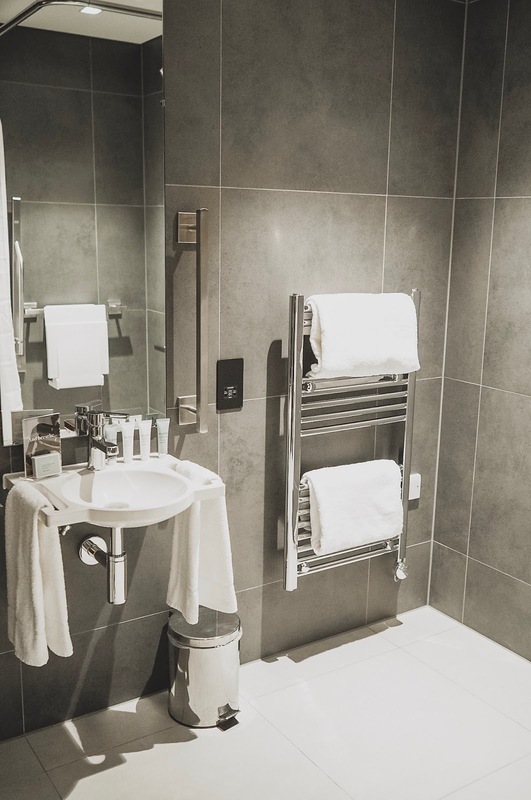 I think this element (which is all available at no extra charge) is such a great touch and helps to reduce the cost of staying in London for long periods of time! It's perfect for people traveling down for work or travelling on a budget because we all know how expensive eating out in London can be! We thoroughly enjoyed our stay with Native and I would definitely come back to stay again. The interiors are lovely, there's a 24-hour team on hand if you have any problems and when you compare the room charge against hotels in the city - you really are getting brilliant value for money. If you want to book a stay, you can do so here - I know I'll definitely be looking into the Natives in other parts of the UK too...Manchester, here I come!